According to Newsweek magazine, Tony Hawk is the "most famous skateboarder, like, ever." A big claim, but with a lot to support it. In the 1980s and 1990s, Hawk almost single-handedly transformed skateboarding from a kids' parking-lot pastime into a respected sport. He won virtually every skateboarding competition he entered, and before he was twenty, he was considered to be the number one vertical skateboarder in the world. Hawk was equally talented off the ramp. His business ventures and product endorsements have made him a very wealthy man, and have also kept him in the spotlight. As skateboarding icon Stacy Peralta told Sports Illustrated, "Tony is the first skateboarder who has given the world a face to put on the sport. He has become a part of American pop culture." When Anthony Frank Hawk was born on May 12, 1968, his parents could not have realized that skateboarding was eventually going to become such an integral part of their lives. As Hawk readily admitted in his autobiography, he was a "hyperactive demon child" who regularly terrorized his babysitters, his teachers, and his parents. He was very bright, with an IQ of 144, but he was also frustrated and unfocused, and would frequently fly into rages. His father, Frank, a retired U.S. Navy officer and small appliance salesman, and his mother, Nancy, a homemaker and part-time business teacher, were equally frustrated about what to do with their youngest child. When Hawk was eight, his older brother Steve bought him, on a whim, a blue fiberglass hand-me-down skateboard, and his father built a skating ramp in the backyard. They hoped that skateboarding might be the outlet that young Tony needed. Hawk was instantly hooked, and soon the young boy with the behavior problems was practicing up to six hours a day, every day. He especially enjoyed the freedom that came with the sport. As he explained to Charlie Rose of CBS News, skateboarding was not like baseball or basketball, which required teamwork and regular practice schedules. "I liked that no one was telling me how to do it," he remarked. When Hawk outgrew his backyard ramp, he began practicing at skateparks near his home in San Diego, California. The scrawny kid with the wild blonde hair stood out among the other skaters. He was so skinny that he had to wear elbow pads on his knees, but the young skateboarder was already experimenting with daredevil moves. "I feel like if I'm not out there getting banged up, then I'm not getting better." Frank Hawk, realizing that the sport had virtually saved his son, became the ultimate skateboard supporter and Tony Hawk's numberone fan. He began by driving Hawk to and from competitions all over the state of California, and soon became even more involved. In 1980, dissatisfied by the quality of the competitions and the lack of sponsoring organizations, Frank Hawk founded the California Amateur Skateboard League (CASL). Three years later, in 1983, he established the National Skateboarding Association (NSA), the first professional skateboarding organization of its kind. Ultimately the high-profile events put on by the NSA were credited with boosting the popularity of skateboarding in the 1980s. Inside the world of skateboarding there is a very real rivalry between two camps: street skaters and vertical skaters. Street skating is done on any surface or any structure found in the urban landscape, including parking lots, handrails, benches, or curbs. Vertical skating is performed on vertical ramps or other structures built specifically for the sport. Street skating came first, coming to light in the late 1970s in California with surfers executing dangerous stunts on the curved walls of empty swimming pools. There were no competitions with prize money, and skaters did not wear expensive designer duds. Street skaters considered themselves to be hip rebels, outside the mainstream. Street-style skaters are still very much present in the 2000s. According to skateboarding insiders, as reported in Sports Illustrated, there are between 350 and 400 street skaters who are considered to be professionals, some of them as young as sixteen. They earn their reputations the old-fashioned way, performing outrageous tricks, without safety gear, in out-of-the-way, illegal places. Although they consider themselves to be "outlaws," many of them make a living from skateboarding. Just like Hawk, they get contracts from skateboard apparel and accessory companies, and they can bring home anywhere from $1,000 to $5,000 a month. However, diehard street skaters do not appreciate the spotlight that Tony Hawk has turned on skateboarding. Many accuse him of selling out to corporate America and watering down what was once an edgy sport. Darrell Stanton, a teenage pro street skater who spoke with Sports Illustrated, echoed that sentiment: "I hope the whole skateboarding popularity thing stops before it gets too mainstream. I'd like for it to stay a raw sport." But statistics suggest that Stanton is unlikely to get his wish. According to the polling company American Sports Data, Inc., in 2003 more kids under the age of eighteen were skating than playing baseball. The biggest boost, however, came in the form of Tony Hawk himself. By age fourteen Hawk had turned professional, joining the Powell Peralta skateboard team called the Bones Brigade. By age sixteen he was dominating the sport. The road, however, was not an easy one. As Hawk won competition after competition, some veteran skaters cried favoritism, since his father was the NSA president. They also dismissed his wild, crazy skating as showboating. But that same creative skating gave birth to the Ollie, which became one of the most important moves in vertical skating. It also helped Hawk win three NSA championships and almost twenty additional pro events by the time he was eighteen. Before he graduated from Torrey Pines High School in 1986, Hawk was earning $100,000 a year from skating in competitions, making public appearances, and endorsing products such as Mountain Dew. Known as the Birdman because of his high-flying acrobatics, he was also a featured performer in Bones Brigade videos, which to this day are watched by would-be skaters. Hawk bought his first house just before graduation, and as he told the New York Times, "That was an inkling that [skateboarding] was already my career." By the end of the 1980s skateboarding was a hot sport, and Hawk was its king. But, like all things, popularity goes in cycles, and in the 1990s the public's interest in skateboarding had begun to wane. Part of the problem was the high cost of insurance required to run competitions and maintain skateparks. As a result, competitions were cancelled and skateparks around the United States were closed. This signaled disaster for Hawk, who now had very little money coming in, and a wife and child to support. In 1990 he had married his first wife, Cindy; two years later the couple had a son, Riley. His career sport was losing popularity, and a worried Hawk considered getting a regular nine-to-five job, possibly in computers, since he was a self-proclaimed techno geek. "I did demos where I could count the spectators on two hands," he recalled to Tim Layden of Sports Illustrated. Instead, Hawk decided to throw himself into a new business venture. In 1990 he and fellow skateboarder Per Welinder launched Birdhouse Projects, a company to manufacture skateboards and skate accessories. In 1992 Birdhouse was followed by Blitz, which distributed other skateboard brands. Hawk mortgaged and eventually sold his home in order to finance his businesses. The rocky start-up proved to be too much of a strain on his family, however, and Tony and Cindy divorced. But just when it seemed that things could not get any worse, skateboarding once again came to the rescue. In 1995 Hawk got a call from executives at the television sports network ESPN, who asked him to skate in a new alternative competition called X Games (Extreme Games). A more-than-interested Hawk flew to Rhode Island, where the contest was being held, and took first place in the vertical competition and second place in street skating. The televised event was seen by millions of people, and almost overnight the interest in skateboarding was re-ignited, as well as interest in Hawk and his career. Soon he was again "hawking" products on television, appearing in countless commercials for companies such as Coca-Cola, Pepsi, and Campbell's Soup. He also hosted a number of sports specials, including MTV's Sports and Music Festival. Of course, Hawk also pumped up his skateboarding. He traveled around the world to skate in exhibitions, and year after year he swept the X Games, taking home both singles and doubles titles. By 1999 the king was back on his throne. During the 1999 X Games, Hawk made history during the Best Trick event, when he introduced a move called the 900, a move so spectacular and dangerous that no one has successfully landed it since. The 900 is a two-and-a-half rotation midair flip above the lip of the vertical ramp. Hawk had been working on the move for more than a decade, and had been seriously injured along the way. Landing the 900 was a personal triumph. As Hawk explained to Rose, "I just felt this great sense of relief that I'd finally conquered this beast that had plagued me for so long." After the 900, it seemed that Hawk could do no wrong, especially in business, where he became a one-man marketing phenomenon. Birdhouse and Blitz took off, becoming two of the largest skate-boarding companies in the world. In 1999, however, Hawk ventured into what would become his most lucrative enterprise—video games. He had been trying to interest companies in a skateboarding game since the mid-1990s, but executives did not bite. "They just didn't get it," Hawk explained to Sports Illustrated. Finally Activision, a California-based company, approached Hawk in September of 1998 about developing a video game. Computer engineers mocked up a working version and Hawk tinkered with it for months, providing feedback and offering suggestions for improvement. When Tony Hawk's Pro Skater was introduced in the fall of 1999, it created an immediate buzz. By Christmas it had zoomed to the top of the video sales charts. Analysts have attributed Hawk's success to several factors. First, even in his thirties he continues to be one of the most talented skateboarders to ever hit the vertical ramp. Second, because of his many personal appearances, he is accessible to his fans. For example, every summer Hawk goes on a multi-city skateboarding tour with members of his Birdhouse team. For those who cannot make it to see Hawk in person, his tours are televised as ESPN specials. Third, according to marketers, Hawk has a squeaky-clean image and is viewed as the perfect family man, which makes him appealing not only to kids but to their parents. In 1999 Hawk remarried; he and his second wife, Erin, have two sons, Spencer and Keegan. All three of the Hawk boys seem to be following in their father's footsteps, and Riley, the oldest, has been skating since he was four. 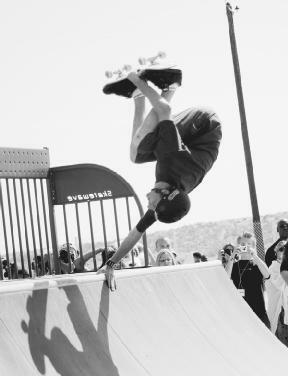 Tony Hawk skates at the Edwards Air Force Base skatepark in California, in 2004. Vegas, Nevada, and featured the best skateboarders, BMX bikers, and motocrossers in the world. Fans were also entertained by some of the hottest new bands around, including The Offspring and Good Charlotte. Following the Las Vegas unveiling, the whole ensemble took off on a 24-city North America tour, performing to sellout crowds. Boom Boom Huck Jam is introducing a whole new generation of kids to skateboarding, but Hawk also wants to make sure that every kid who wants to skate has a chance. In 2002 he established the Tony Hawk Foundation, which provides money to help build and promote skateparks in low-income urban centers throughout the United States. Since its inception the foundation has given assistance to more than 125 skateparks across the country. Hawk has endured many on-the-job hazards, including a broken elbow, cracked ribs, more sprains and scrapes than he can count, and multiple lost teeth. On the other hand, he has become a multi-millionaire and a living legend, all from riding on a board with wheels. A real pioneer of skateboarding, Hawk invented nearly one hundred tricks and moves that have been handed down to young skaters today. More important, he continues to serve as a role model and inspiration for children who consider him to be one of their all-time favorite sports stars. In fact, in the early 2000s, Hawk consistently topped most teen polls. For example, in 2003 and 2004 he was named Favorite Male Athlete at the Nickelodeon Kids' Choice Awards. All this, however, is just icing on the cake for Hawk. As he explained to Sports Illustrated: "Here's what skateboarding is to me. It's my form of exercise, my sport, my means of expression since I was nine years old. It's what I love. I never expected it to give me anything more than that." Hawk, Tony, with Sean Mortimer. Hawk: Occupation: Skateboarder. New York, ReganBooks, 2002. Ault, Susanne. "Hawk Splices Games, Music, Sports for HuckJam." Billboard (September 28, 2002): p. 16. Givens, Ron. "Skateboarding's Best Seller." New York Times Upfront (December 11, 2000): p. 20. Gordon, Devin. "Newsmakers: Tony Hawk." Newsweek (October 14, 2002): p. 71. Layden, Tim. "What Is This 34-Year-Old Man Doing On A Skateboard? Making Millions." Sports Illustrated (June 10, 2002): pp. 80+. Rose, Charlie. "Tony Hawk Takes Off." CBSNews.com: 60 Minutes (June 16, 2004). http://www.cbsnews.com/stories/2002/12/10/60II/main532506.shtml (accessed on June 21, 2004). Tony Hawk Official Web site. http://www.tonyhawk.com (accessed on June 21, 2004).